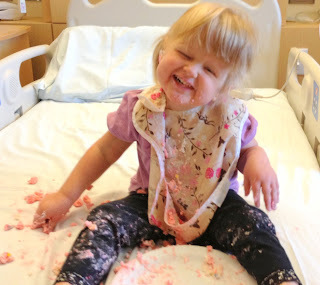 Yesterday, Scarlett had her very last chemo! We did not plan much because we had short notice that her counts were okay, and she usually feels pretty icky, but the nurses had a different plan: cake! Apparently it was put in front of her before any cameras were ready. This was the first shot. She ate the ENTIRE thing. Without slowing down. And loved every bite! I had to be at work in the morning, and I missed the whole celebration by about 5 minutes. As crushed as I was, it was great to walk into a room filled with giggles and frosting. Scarlett had a great day, other than the chemo being pumped into her chest. 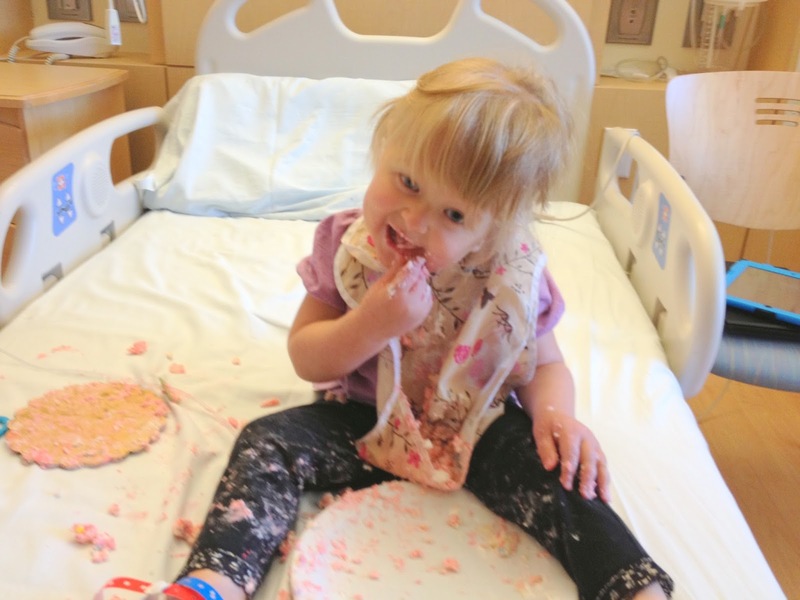 Those nurses have taken care of her for almost 3 years now, watching her grow and thrive despite the treatments she has had to endure. I think they were just as excited as we were. So, we begin yet another new chapter of Scarlett's life. From here on out, she gets labs once per week for the next month, and then every three months as she gets MRIs. We're far from finished...we've been here before. It was almost exactly one year ago that the "mystery spot" showed up in her MRIs; she had been off chemo for about 6 months. Waiting for the next three months, the next year, the next five years will be filled with anxiety. Five years of clear scans is considered safe, so we have a long way to go. It also the 6 month count down to her next surgery. In six months, she should have a stronger immune system and somewhat repaired healing, and that means it's time to work on rebuilding her skull. Once that goes smoothly (knock on wood), she can have her port catheter removed. We're also still on watch. If she gets a fever, she needs to be monitored closely and could end up in the hospital. A fever could be a sign of an infection in her port, which would have to be treated intensively. We are also always on the lookout for shunt issues - fingers crossed, there's no problem there. All that is just part of our daily life. There is no holding her back. She is climbing on to and out of everything - out of her high chair, out of the grocery cart, on to the couch, on to every surface she can reach to get one level higher. She is unstoppable. She says two words simultaneously with signs - "bath" and "walk". She will begin her second year of preschool on Monday, in the same class she was in last year. She is not able to tell us, but I know she misses them. We have a picture of her teacher, aides and friends next to her dresser, and she points and smiles at them every day. It will be great for her. 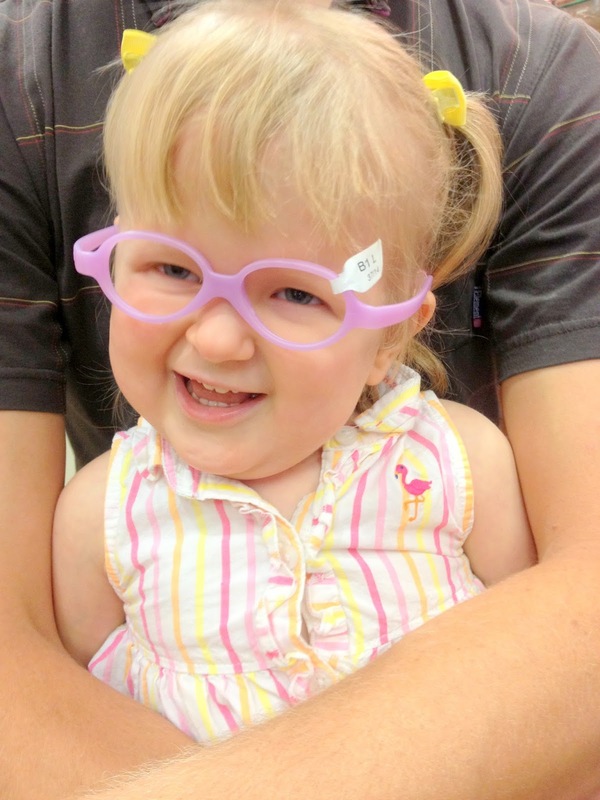 We tried on glasses last week - this was our choice, and they should arrive any day now. 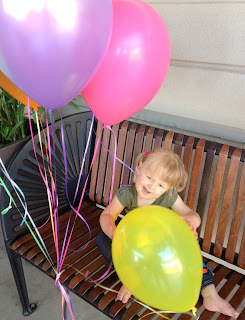 She lucked out when someone outside the hospital handed her a bunch of prohibited latex balloons. 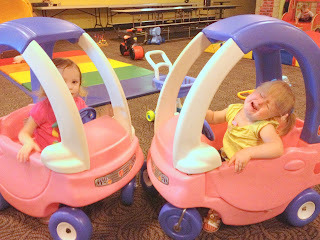 Driving with her buddy Alanna - I clicked the picture right as they crashed! I am so proud of this girl. 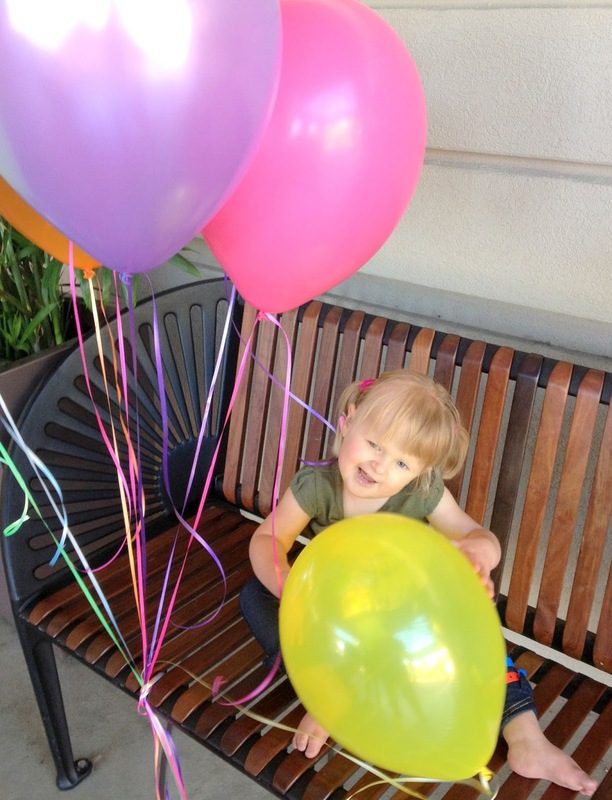 She is just an amazing joy, and we are lucky to be her parents, and to have the opportunity to fight for her. Please don't forget our friends LJ, Phoebe and Abby. All three are entering hospice care. All 3 beautiful little girls - they are all between 3 and 5 years old - deserve better than this disease has given them. We also got a message from a family whose baby was diagnosed with the same very rare tumor as Scarlett - baby Maggie in Ireland has a long road ahead. And finally, a friend who has been integral to helping our life to keep rolling since just before Scarlett was born, has also entered a frightening cancer diagnosis. It is just plain unfair, and I hate it. September is Childhood Cancer Awareness Month. I will post more soon, but PLEASE do something to share the news. Paint your nails GOLD. Wear something GOLD. Tell a friend. Donate to a worthy organization that is funding life-saving research. 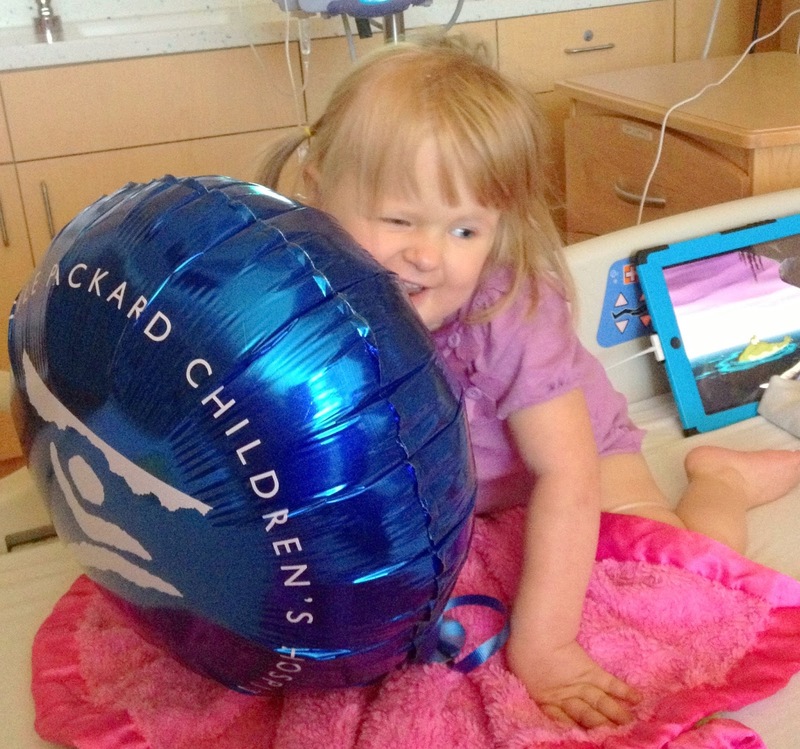 Share Scarlett's story with someone, and tell them to share it too. The more people we tell, the less "rare" this becomes. Pink yarn for Breast Cancer Awareness month in October. Good for them. But I have never, ever seen a display of anything for childhood cancer. Or brain cancer, for that matter, but that's another month. This needs to change. I wish you guys the best luck. I've been following Scarlett since we were on the same birth board. I work at a children's hospital and see so much that these kids endure. It's amazing what they go through and still smiles on their faces! I'm going to ask them the same question that you asked at the end of that last blog, why doesn't childhood cancer any type of displays similar o breast cancer. I would love to know the answer just as much as you! You and your family have been amazing throughout your journey. Congrats on the close of this chapter and best wishes for the next. 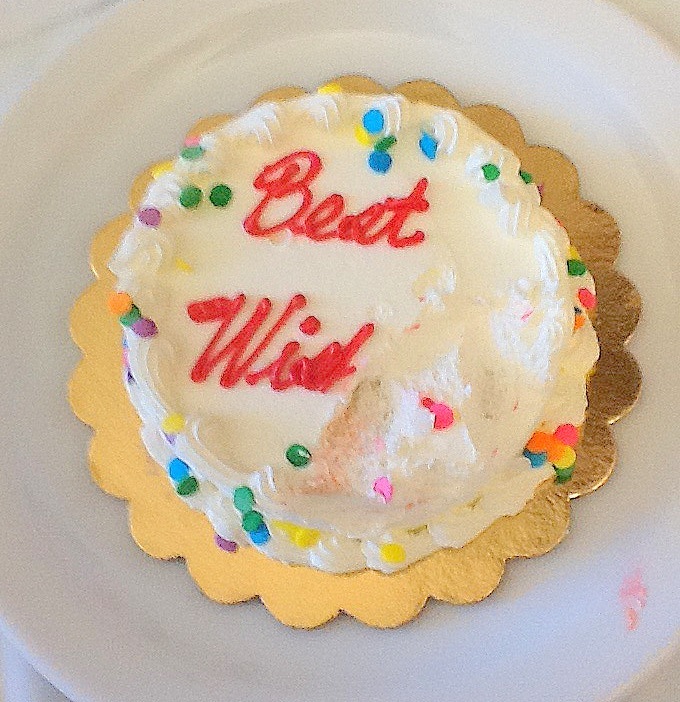 Sending Scarlett a virtual cake! And I will be keeping LJ, Phoebe,Abby, Maggie, your friend and their loved ones in my thoughts. 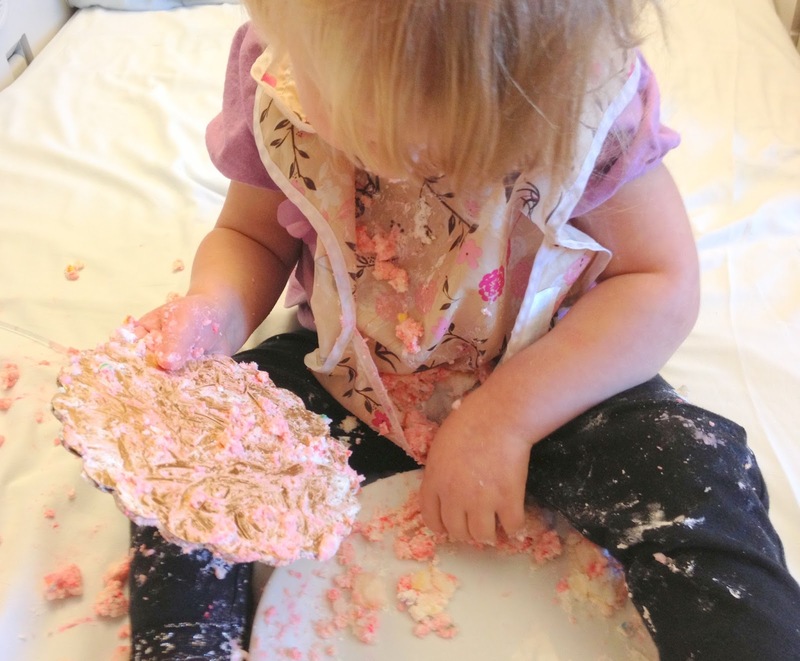 Love the cake pictures!! 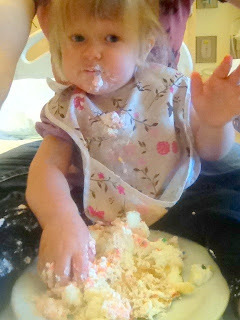 :) Scarlett deserved that cake, I see she thoroughly enjoyed it too. Yea for no more chemo! Praying and praying for clean scans for the next 5 years and one healthy, happy girl. Praying for these others who are suffering so much from this nasty disease. Yay Scarlett! I will be praying that this is really and truly it for the chemo train. On the subject of these ridiculous displays. As a breast cancer survivor- the things done in the name of awareness make me ANGRY. 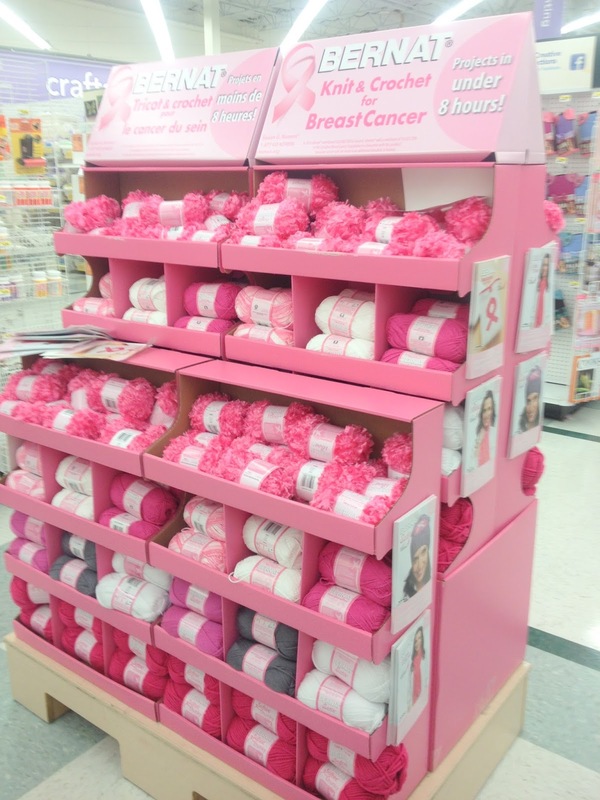 There is a term in the breast cancer- pinkwashing. 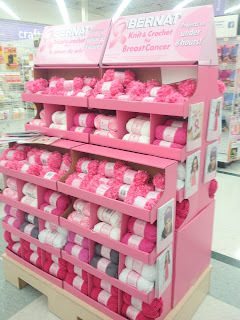 Everything from water, to races, to apparently yarn will be turned pink and sold in the name of breast cancer. Most of these items don't do anything for this disease other than "raise awareness". Sorry for the mini rant, but I guess my point is you aren't missing out on anything from that regard. Awareness for childhood cancer- support for these amazing people who beat the odds and then have to deal with the after effects for the rest of their lives. Cures, research, treatments. I will break out the gold this month in honor of scarlett.